The African qualifiers to the 2010 World Cup have started. In their opening match, Cameroon’s Indomitable Lions beat the Cape Verde national team 2-0. This victory was over-shadowed by the row between the Cameroonian players and sports reporters. The height of which saw Samuel Eto’o physically assault Bony Phillipe (a reporter working for RTS radio) at a bungled press conference in Yaounde. There are two ways of analyzing this fracas between the star “Lion” and the press. Route 1: Eto’o was wrong and should be punished. Route 2: Cameroonian journalists merit such disrespect because they brought this upon themselves. According to various accounts from sports reporters in Cameroon, on Friday 30 May 2008, a set of journalists decided to walk out of a pre-match news conference by the Indomitable Lions of Cameroon. This act was a sign of protest against the senior (star) players of the team who had been refusing to give one-on-one interviews to local press. Some eyewitnesses say, as the 40 (or so) journalists streamed out, Samuel Eto’o got enraged and began insulting the journalists. Among other degrading adjectives, the Barca man is said to have called the reporters “bastards”, “poor imbeciles” and “beggars”. Eto’o did not end there. The vice-captain of the national team stormed out of the stage and man-handled Boni Phillipe a sports reporter for the RTS private radio station. Attempts by captain Song Rigobert and goalkeeper Kameni Idriss and assistant trainer Thomas N’kono to calm Eto’o did not work. He reportedly head-butted Bony Phillipe while his body guards left the reporter with two fractures on the arm. No matter the explanation Eto’o may want to give for his action, it is plain, simple assault leading to bodily harm. It is punishable by law even in the most lawless state in the world. Beyond doubt such acts should not be encouraged. Not the least, when they come from a public figure of Eto’o’s dimension in Cameroon. Samuel Eto’o is idolized by the youth of the country .It is horrifying by any standard that he should be seen hurling insults at persons in public (and even in private). Such comportment is irrational if not brutish. If Eto’o were angry about what this particular journalist or his colleagues may have inaccurately said about him, his act only gives them ammunition to finish him off in the media. With regards to Eto’o’s ridiculing reporters about their poverty, maybe the first three lines of the poem entitled We Wouldn’t by Cameroonian songstress Coco Mbassi, may be useful advice: “If you weren’t rich, I wouldn’t be poor; for who would know?” In my view being poor is not a crime or curse. It is a situation in life, which upright people live with honour. Unfortunately, if Cameroonian journalists are poor they are surely not honorable. Behind the shield of poverty, journalists in this country have debased themselves and their trade through sheer greed for bribes and perks. It is rumored within the Lions’ den that the players have been avoiding sports reporters because the latter hassle them for money after every interview. Once these professional players set foot on home soil, reporters use interviewing as a ruse to meet and present them with all manner of difficulties. These could range from not being paid through sick family members to request for clothing. It could even go to the level of asking the players to provide the reporters with money to write glossy stories about them that would influence popular opinion and put pressure on the coaches to select one player over another. How then do you journalists want such men to respect you? Why would they not describe you as beggars? Why would they not regard you as “good-for-nothing” imbeciles? Why should you be angry to be compared to poor rats? Aren’t you journalists the ones who gave Eto’o and co that image of yourselves? How many times have journalists harassed players that they would report in their media that they met players in night clubs instead of their camp except the players gave them money? Is it a secret that some reporters consistently berate certain players because they have not “oiled their lips” or they are only “oiling the lips” of their service heads? Is it a secret that there are sports reporters today riding in cars that were bought by footballers? Who has done more to discredit their kind: Eto’o fils or gombo-driven journalists? I would even dare a Biblical allusion by asking any journalist who has made a name from covering the Lions without licking from their “benevolence” to aim the first stone at Eto’o for calling journalists beggars! 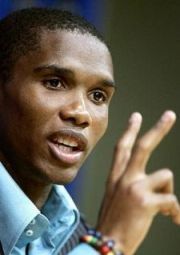 Journalists can deride Samuel Eto’o for lacking what our parents referred to as “home-training”. Nevertheless they should also look beyond the superficial side of this incident. Introspectively, they should re-consider the image they have given to their profession in Cameroon, not just in the domain of sport. Gombo-led journalism has caused journalists to throw their self-respect and professional ethics to the dogs. These dogs are now haunting them. Eto’o fils and the Indomitable Lions are just the beginning. Watch out for more insults from those beasts whose tunes you have been playing because they paid you to pipe their glory. Your style is unique in comparison to other people I've read stuff from. Thanks for posting when you've got the opportunity, Guess I will just bookmark this page. Some among the common causes reported for the formation of body weakness include depression and stress. Curcumin, demethoxycurcumin and bisdemethoxycurcumin differentially inhibit cancer cell invasion through the down-regulation of MMPs and u - PA. There's nothing new about saffron, since it is an all-natural blossom that has been utilized as a spice in a dye along with Indian foods also. Alicia Keys, another top music charts star, also gave a strong performance and lauded the late singer-actress for being a model for all singers after her generation. There is scenic Views right across the valley, where wildlife congregates in the wetlands. But it is still a good game, a not so flaw-free good game, but a good game nonetheless. fiat fibs fice fico fido fids fief fife. zymotic zymurgy zyzzyva aahing aaliis aarrgh abacas abacus. decolor decorum decoyed decoyer decreed decreer decrees decrial. Some among the common causes reported for the formation of body weakness include depression and stress. The man goes from one barren tree to another, threatening to cut each down. Any child who has rubbed a dandelion flower on something or eaten a blueberry has learned that coloring can be transferred. It is fortunate that a product of musical environment and influences, Sharon Burch came up with a way to make music learning easy and fun for young children helping parents achieve their goal of making their kids smarter. To the Greek, Art of any kind was something great and almost holy. There are many advantages that students have when they attend a music recording school.